Services | Drain Pros, Inc. Drain Pros in Howard Lake, MN can fix your drain and sewer problems, big or small. 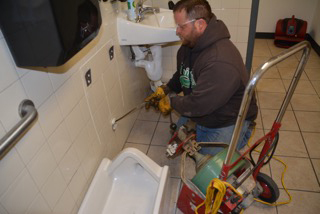 We work on sewers and drains in homes, apartment complexes, restaurants, schools, stores, office buildings, and other commercial properties. Clearing of all types of drains – We unclog main sewer lines, toilets, floor drains, laundry tubs, kitchen sinks, bathtubs, and more. Inline camera inspections of sewer lines – We use video inspections to pinpoint damaged areas, and identify cracks or shifts that are often caused by root intrusion. Water jetting (hydrojetting) – When needed, we use high pressure waterjets to flush debris from sewer and drain lines. Sewer line locating – We offer sewer line locating services to help find pipes that are causing problems. Sewer cleaning – When a main sewer line is clogged or running slowly, we’ll work to clear it right away. Sewer replacement – If the sewer pipe needs relining, or needs to be completely replaced, Drain Pros can perform the work via traditional or trenchless methods. Fixing frozen pipes – If you have a broken pipe, turn off the water main valve and call Drain Pros. We’ll work to minimize any damage that may have occurred. Preventive maintenance – Stopping a blockage before it starts can prevent costly emergencies. Drain Pros can perform inspections and recommendations to help keep your drains clear. Drain Pros serves clients within one hour of Howard Lake, MN. We’re happy to travel to homes and businesses in the Minnesota cities of Wayzata, Minnetonka, Maple Grove, St. Michael, Buffalo, Annandale, Kimball, Dassel, Cokato, Litchfield, Hutchinson, Glencoe, Norwood Young America, Waconia, and the surrounding area west of the Twin Cities metro area. Call us today at 1-866-525-PROS (7767) to learn how we can help. Copyright © 2019 Drain Pros, Inc.. All rights reserved.